Supporting the preparedness of the Alaska Tribal Health System. 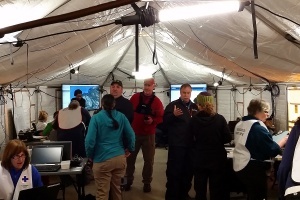 Being prepared for an emergency takes on a different meaning in Alaska, where natural hazards are common and access to critical care presents logistical challenges for communities off the road system. To support the health of our communities and people, ANTHC developed the Emergency Preparedness program in an effort to support the readiness of the Alaska Tribal Health System (ATHS). In many areas of the state the ATHS is the only health care provider in the region and, as such, will provide care for all during emergencies. 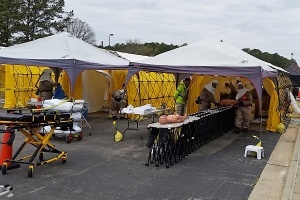 The Emergency Preparedness program provides consultative services and technical assistance aimed at building the emergency management capacity of ATHS through supporting six regional hospitals, statewide partners and local community members. The program reaches this objective by focusing its efforts around specific elements of the preparedness cycle: planning, training, exercise and evaluation/improvement planning. The Emergency Preparedness program assists in the development of emergency response plans (ERPs) for clinics and emergency operation plans (EOPs) for hospitals. In addition, the program works to create customizable trainings and workshops that address self-identified emergency management gaps. The Emergency Preparedness program also assists in the development of exercises; specifically table top, functional and full-scale exercises which are designed to educate participants and validate emergency preparedness policies and plans as well as identify opportunities for improvement. Additionally, the program offers site visits intended to evaluate the readiness of Tribal health organizations and provide actionable recommendations for improvement. Site visits include but are not limited to the review of the health organization’s emergency operation plan, policies, training plans, facility management plans, operational mechanisms for command and control, communication and resource management. These site visits conclude with a developed report provided to the health organization that captures findings and makes any necessary recommendations. Site visits are a great resource for Tribal hospitals involved in the State of Alaska’s Department of Health and Social Services’ Hospital Preparedness Program. In the event of an emergency or disaster, the Emergency Preparedness program works as a liaison, connecting communities, partners and Tribal health organizations with the Division of Homeland Security and Emergency Management, and the Department of Health and Social Services. The program will also send team members to communities, when requested to respond to disasters.